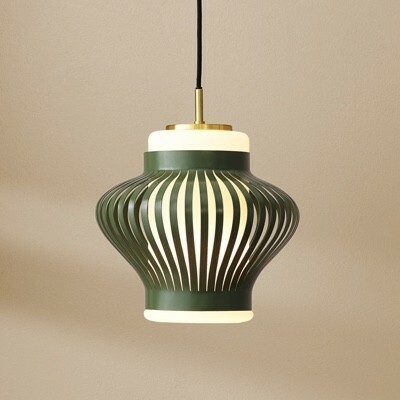 The Opal Shade pendant is another variation on the Opal range by Svend Aage Holm-Sørensen in 1959. Produced from opal glass which creates a warm glow. The glass centre of the lamp then has a large shade on it which increases the amount of light reflected back down, the metal shade has small grooves which creates an interesting light effect. The shade can be selected in various different silk matt colours, all mounted on a brass suspension. The lamp emits indirect ambient light with an emphasis down which makes it ideal for above dining tables.